DB Sports Tours are thrilled to announce details of a new competition – the Cork Cup. The competition, which will be held in April 2016, will be held in the holiday resort of Trabolgan in Cork. 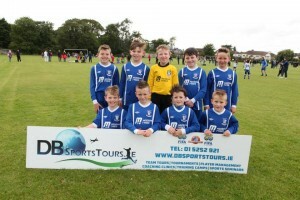 Here at DB Sports Tours we of course specialise in creating a vast array of soccer tournaments for Irish youth clubs. While we arrange team tours to the UK and global tours to Spain and abroad elsewhere, we want to make sure the Irish market – with Irish tournaments – remains at the fore of our work. From April 1 – April 3 next year, the Cork Cup will look to provide players with the essential setting for development into better players, all the while staying in our own shores here in Ireland. The tournament, which is endorsed by the Cork Schoolboy League, and will host teams from all over the country, will cater for four age groups: under-9 (born in 2007), under-10 (born in 2006), under-11 (born in 2005), and under-12 (born in 2004). Each team will be guaranteed four matches minimum, will be played 7-aside and on real grass pitches. Accommodation will be in the Forest Oaks area of the Trabolgan Resort, which houses sleep between six and seven people comfortably. During your stay, you can expect both breakfast and dinner as part of your exclusive package. Another aspect as the forefront of our work here at DB Sports Tours is equality and diversity. Ultimately, we want to cater for as many people as possible, therefore affordability is key. Each child’s placement will cost as little as €119, while each adult costing €139 for the 2 night stay. Team Registration will be €130 per team. At such affordability, we see the Cork Cup as a crucial step forward in the development of those lucky young players who attend next spring. We hope we hear from you soon, for more information on our work here at DB Sports Tours have a look at the blog here.